I went on a crazy productive cleaning binge yesterday. I haven’t been keeping up with my housework and chores very well lately. I’ve been pretty busy or under the weather for the last few weeks, and just felt really behind. I’ve kept up with the important stuff of course (i.e. clean bathrooms!) But, I still felt behind with a lot of stuff. Yesterday it was all really bugging me and I cleaned everything! On top of that I fertilized the yard, took out all the summer clothes I was saving from my oldest son, for my youngest son, and baked this awesome banana chocolate chip overload bread. Crazy productive am I right? I ended up with one of those bunches on bananas that just didn’t end up ripening right from my last grocery shopping trip. You know what I mean right? The bananas have been sitting a while, you know they should be ripe but, they are this odd not quite yellow not quite green, brownish yucky color. They really really look unappealing to eat. I won’t eat them anyway. Technically there is nothing wrong with them but they look yucky and I personally don’t think they always have the best flavor. I wonder why this happens? My suspicion is that the bananas were picked to early and will just never ripen properly as a result. I don’t know for sure. Next, I realized that if I made this both of my kids would totally be demanding pieces for breakfast. But, my littlest one can’t tolerate dairy of any sort. Even butter it seems. Major tummy trouble. So I either make the tasty treat dairy free or have to have something else on hand for a special treat for him. Dairy free it is. SK’s recipe called for butter, but I had vegetable shortening on hand. I figured that would probably work. I also had dairy free chocolate chips in the cabinet (my mother in law found them for me!) so I was golden for the little one. Then, I started thinking I better add extra flour if I’m going to take away the coco… you get the idea. 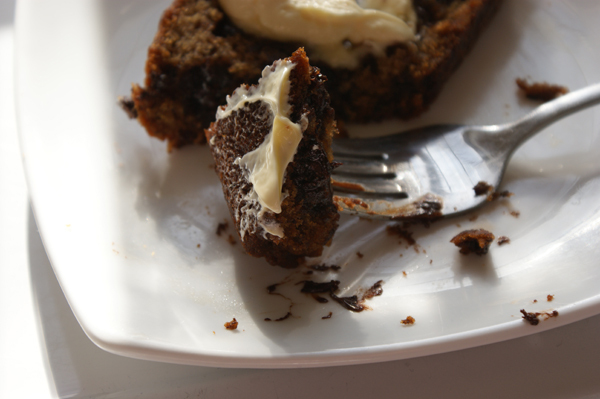 So I adapted, baked, and here you have it, very very chocolaty banana bread. It’s not the same as SK’s but well worth a share if I do say so myself (and I do). I know I’m going to have to give the Smitten Kitchen recipe a try sometime too. I can just tell it will be awesome. But, meanwhile this adaptation is soooo good. 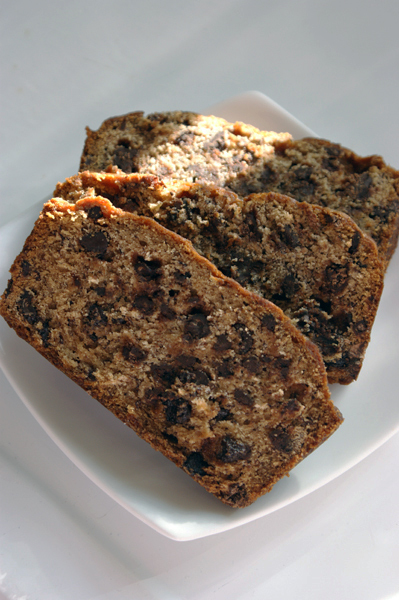 This is chocolate lovers bread with a nice shmear of banana. 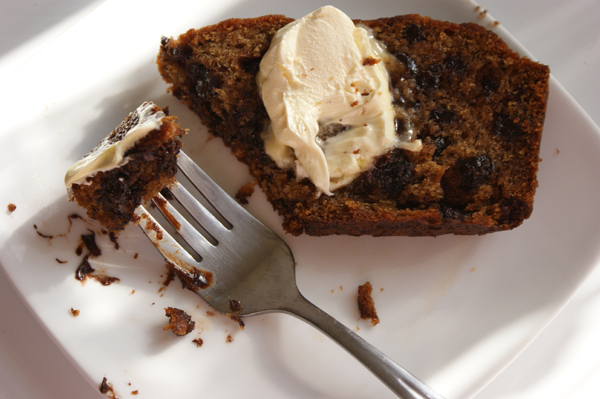 Dense, moist, and oooey, gooey with chocolate! Thank you SK for the inspiration. One tip: Cool the bread completely, preferably chill it in the fridge before cutting slices. There is so much chocolate in the bread that the slices will fall apart if cut warm. I admit you may not be able to resist trying it right out of the oven…. but it does cut better if you can manage. 1. Preheat oven to 350* and grease a bread pan with spray oil. Set aside. 2. In the bowl of a large stand mixer add bananas. Using the paddle attachment briefly "mix" the bananas. They will mush up a bit and be somewhat chunky. 3. Add the shortening, brown sugar, and vanilla. Mix well. 4. Sift together the flour, salt, and baking soda. Add to the banana mixture. Mix until well combined and smooth. Stir in chocolate chips. 5. Pour the mix into the prepared loaf pan. 6.Bake at 350* for 50-55 minutes. A toothpick inserted into the bread will come clean when the bread is done. (Though you may get melted chocolate from the chips.) Cool the bread completely (Chilling in the fridge overnight is best of all.) before cutting or slices will not hold their shape due to the large amount of chocolate in the bread. Feel free to substitute a 1/2 cup of butter for the shortening. If you use dairy free chocolate chips this entire recipe is dairy free.